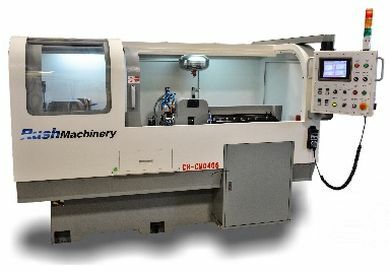 Rush Machinery's CH-CM0406 Cut Pre-Point Chamfer Machine makes carbide blanks that are ready for tool grinding. The machine converts blank carbide rods into tool blanks. It is ideal for cutting tool manufacturers that want to make tools from a blank that is already pre-pointed and chamfered. The machine is easy to setup and runs unattended. Pre-point angles are generated through interpolation. The interpolation is automatically calculated based on parameters entered by the operator during setup. The parts are held in place by two collets and the part is transferred from the cut and pre-point collet to the chamfer collet directly. A transfer device deposits the completed piece into the collection basket.